Celebrity is an upscale cruise line that places an emphasis on customer service. There’s a culinary focus to many of Celebrity’s onboard activites, which include wine tastings, cooking classes, and Top Chef – style competitions. 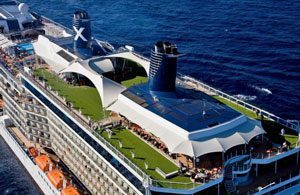 Celebrity’s Solstice-class ships feature a Lawn Club on the top deck, with a real grass lawn, games, and dining. Celebrity Cruises ships sailing from Miami include Celebrity Eclipse and Celebrity Equinox. Celebrity’s sophisticated Eclipse was refurbished in 2015. The ship still has great restaurants and a real grass lawn, plus new craft cocktail and craft beer bars. Multiple dining options, the Canyon Ranch Spa Club, and a green grass lawn on the top deck are just some of what awaits passengers on the Celebrity Equinox.